Click on the pictures to open a full-size version in a new window. For this meeting, we were in the small event room of the Roseville Warehouse Ministries Church. 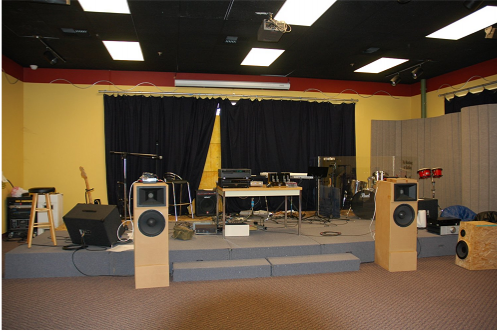 This was a perfect size room for the speaker demos and the room treatment made for a very listenable room response. Below are pics and some desciptions. If you can supply additional pics to me or have descriptIons, driver compliments or other info about any of the projects shown here, I will be happy to post them--just use the links below or contact me. A quick one week project using a Peerless high efficiency 10" mid-woofer and a Seas 27TDFC tweeter. As usual I wanted to bring something a little different. 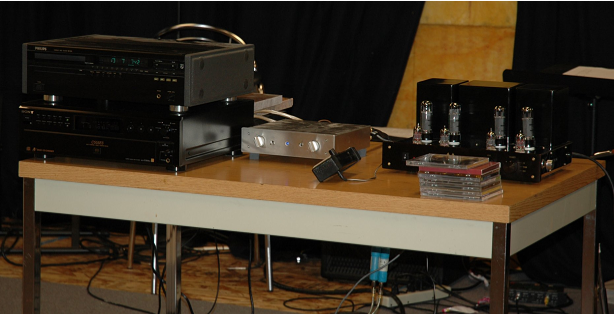 The woofer was a buy out from Madisound 10 years ago and is special order only. It offers an excellent flat and extended mid range (for a 10") to about 3,500 Hz. The Seas tweeter is a current model. Woofer is Reflex loaded with a 4" diameter X 11" long rear port tuned to 34 Hz. Enclosure is about 1.6 cu.ft. Simple 5 component 2nd order electrical, 4th order L/R acoustic layout. System net efficiency is about 1%. 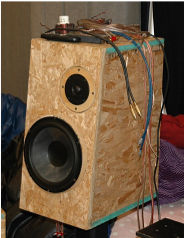 The woofer is forward mounted on a "phase" correction ring. This roughly aligns the acoustic centers of the two drivers in the horizontal plain. Very dynamic in a small room. Reasonable performance considering the quick build and simple crossover. 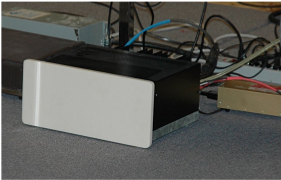 Stock "Audio Sound Labs" 30 watt per channel class A integrated. One of the first production run. 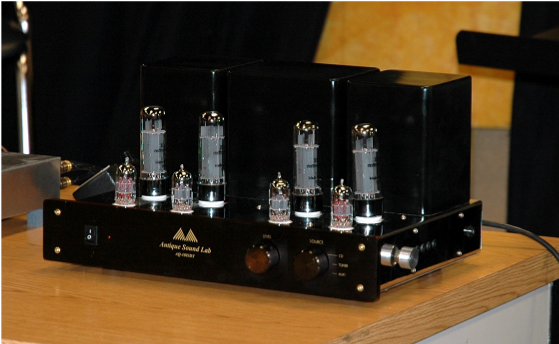 EL-34 finals and custom wound "Ultra Linear" output transformers. Good but not great all around performer. Sony ES SCD-C555-ES (courtesy of Jonathan B.) and other electronics. 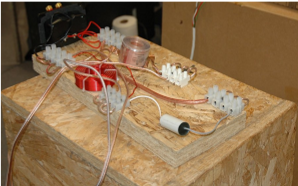 Left Pic: High Efficiency 2-way system, ~ 100 dB/W using an Eminence 12-in. Delta Lite with phase plug crossed over at 1.6K to a 2-in. Horn Driver. A soft dome, aimed upwards, is located at the rear to provide additional room reflections. The frequency response is really flat to 16K but above that the horn dimensions cause breakup. The the soft dome tweeter greatly improved imaging, even in the large room. Right Pic: This is a Modified Dynaco ST 150 amp. Steve says: "Top secret mods so don't go bidding these up on E-Bay till I have purchased a few more!" 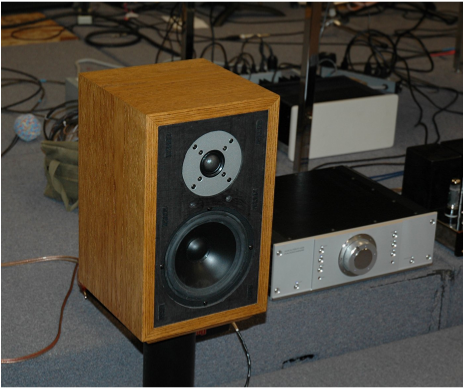 This speaker was built using a Vifa P17SJ-00-08 6.5" LF driver and a North Creek D28-06S 1" dome HF driver. The crossover at 1.8kHz is 2nd order. This system was designed using LEAP/LMS and Praxis. 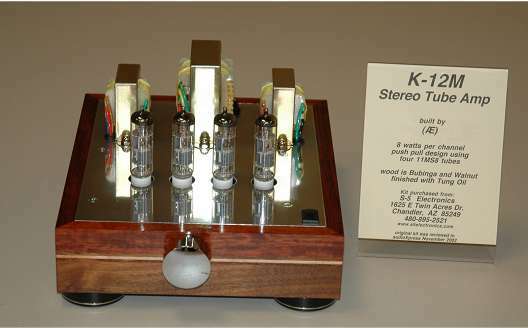 Click here to open a nice online review of the K12-M amp from AudioXpress.